Your new favorite movies app has arrived. For years, Disney Movies Anywhere has been the unsung hero of the digital world. With a simple sign-in, your Pixar, Marvel, Star Wars, and, of course Disney, flicks could be accessed on any device, regardless of where they were purchased. And now Disney is bringing that magical streaming convenience to the rest of your iTunes, Play Store, Vudu, and Amazon libraries. Starting today, Disney is dropping its name from Movies Anywhere, and is expanding the service to include more than 7,000 titles from Fox, Sony, Universal, and Warner Bros. That opens it up to a much wider selection of films, and eliminates the need to download and sign into various apps just to watch something on a different device. The impact on you at home: In a word, this is huge. Ever since the first movies were released digitally, we’ve wanted a universal locker to store them all and easy access across all of our devices. As someone who often switches between iOS and Android, I’ve had to repurchase movies too many times just because I wanted to watch it on a different device (I’m looking at you, iTunes). But now those days are nearly behind us. There’s still a long way to go, of course, but this is a giant step toward creating a friendly, seamless way to carry your movie collection across devices. And maybe, just maybe this will be the final blow to the awful Ultraviolet service Hollywood keeps pushing on us. 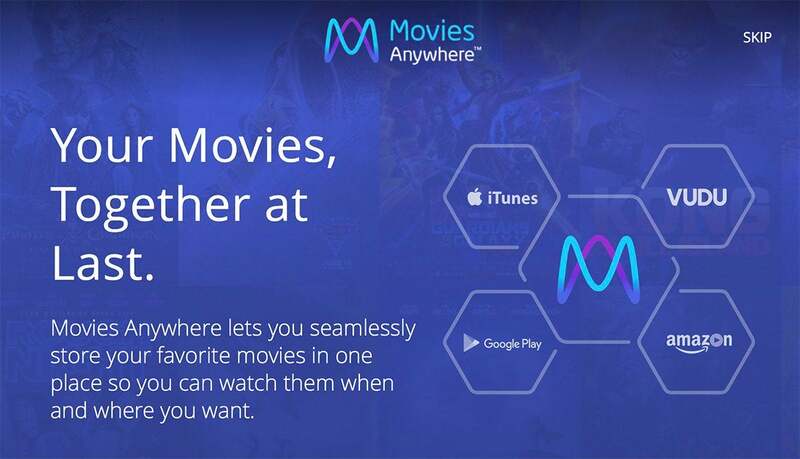 Download the Movies Anywhere app from the iOS, Google Play Store or Amazon app store. Tap the Get Started button and choose how you want to sign in (Google, Facebook, or email). Once you’re logged, select Manage Retailers (on Android phones you’ll need to click the menu icon at the top left first). Choose the service you want to connect. (You’ll need to be on an iPhone in order to link your iTunes account, and you’ll be taken to the iTunes Store). Tap on the My Movies tab to browse your library. Setup is easy on the new Movies Anywhere app. That’s all there is to it. The app grabbed a significant chunk of my movie library, which is quite large. Of the 300 or so titles I own, 178 turned up in the Movies Anywhere app. I assume more studios (such as Lionsgate and Paramount) will sign on as the service spreads in popularity. The app is available for Apple TV, Roku, Kindle Fire, and Fire TV devices, and it also supports Chromecast. You’ll notice that Microsoft isn’t one of the services supported, so Surface users are out of luck. That's not a complete surprise, as Microsoft Movies was dropped from the Disney Movies Anywhere app in September. Movies can be downloaded or streamed, but they only play in HD, so Apple TV 4K users will still want to use the Movies app for 2160p content. 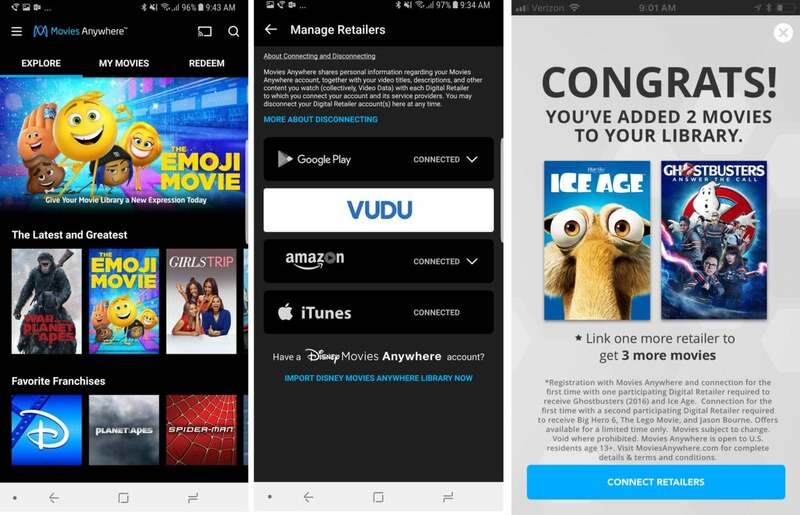 Anyone who signs up for the service can get up to five movies for free: two after linking the first account (the original Ice Age and the latest Ghostbusters), and three more after linking the second (Big Hero 6, Jason Bourne, and The Lego Movie).